This sterling silver poison ring on Etsy flips open to reveal a secret compartment inside. This Traum Heirloom Safe is a highly detailed vault crafted in Switzerland. It can be interior lighting, dual electronic locking systems and can be custom designed to fit your needs. You can pick them up at FrontGate for a measly $180,000. These PocketBands are wristbands designed for active, outdoor activities. 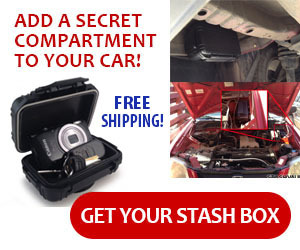 They include a secret compartment to store a key, cash or other valuables. This picture frame from Sears opens up to reveal a secret jewelry compartment inside. Overstock.com offers this wall mounted mirror that opens up to reveal a secret jewelry compartment inside. This antique dresser has multiple jewelry compartments that swivel out of each side of the top to hold jewelry and small items. SkyMall offers this stand-up mirror that opens to reveal this jewelry cabinet behind.